I was going to go all, “Look! David Brooks has written an inadvertent autobiography” in this, his latest and perhaps strangest column. There are some in the Twitterverse who think that the piece, titled “The Thought Leader,” is actually triple-secret irony, with Brooks — that famously introspective savant — fully aware of the self-parody/indictment. Me? I think Brooks has the self-knowledge of a capybara, and that he is (or was, until this morning’s point-and-laugh-fest) blissfully, almost heroically gifted with false consciousness, of such total potency as to blind him to the utter vacuum that lies at the core of his life and work. It takes a special sort of man to surf past salad bars at Applebees to a self-appointed role as the always-wrong philosopher king of American public discourse. Anyway, despite the end of term slough of despond/mountain of unchecked papers on which I descend/ascend,* I was all set to do a line by line fisking — until I reflected that in this vale of tears we are yet blessed by the FSM with the existence of Charles Pierce. He does not disappoint. Admittedly Brooks’ catastrophe of a column is an astonishingly target rich environment — but Pierce rises to the challenge of swatting each and every offering. Actually, most little boys and girls in ancient Athens grew up wishing they weren’t slaves, and wishing they weren’t chasing sheep across a rocky hillside, and hoping they wouldn’t be dead of cholera before they were 15. In Renaissance Florence, they dreamed of not catching the Black Plague. Brooks seems to believe antiquity was populated entirely by over-educated spalpeens. Who was left to herd the goats, I ask you. And something can’t be both a phrase and a paragon, not even If You Capitalize It. Any little boy or girl in ancient Athens could have told you that. It goes on from there. It’s not pretty. Read the whole thing. Then lie back and grin. 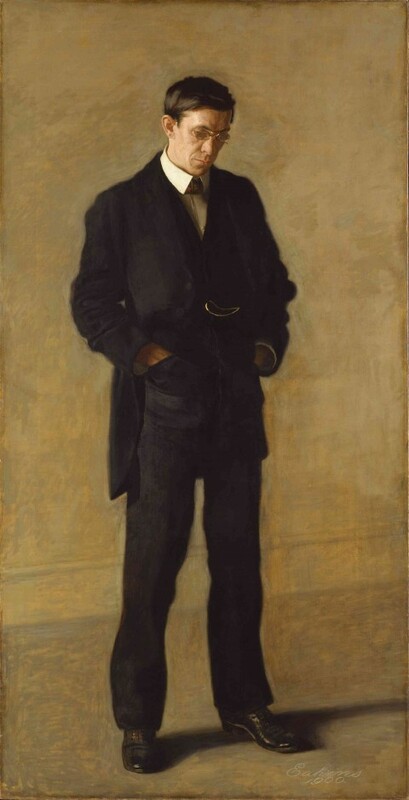 Image: Thomas Eakin, The Thinker: Portrait of Louis N. Kenton, 1900.